New carbon capture technology is being tested for the first time in the UK on a working coal-fired power station. A 30-tonne test unit will process 1,000 cubic metres of exhaust gas per hour from Longannet power station in Fife. Carbon dioxide will be removed using chemicals and turned into a liquid, ready for storage underground. 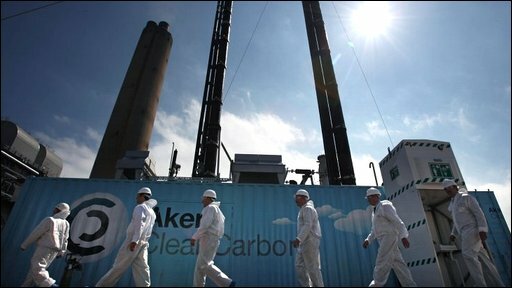 Energy company ScottishPower wants to test technology which could lead to a full scale carbon capture plant becoming operational by 2014. The UK government recently gave the go-ahead for a new generation of coal-fired power stations provided they were able to limit their CO2 emissions. The scientists have focussed on the post-combustion method of carbon capture and storage (CCS) which aims to trap greenhouse emissions after fossil fuels have been burnt. The plant, developed by Aker Clean Carbon, will enable them to assess the effectiveness of chemicals, known as amines, at removing CO2. Researchers from the University of Edinburgh will join the project, testing three different types of amine solution over the next three months. ScottishPower chief executive Nick Horler said: "This is the first time that CCS technology has been switched on and working at an operational coal-fired power station in the UK. "It's a major step forward in delivering the reality of carbon-free fossil fuel electricity generation." ScottishPower's parent company Iberdrola said the UK would be its global centre of excellence for CCS development, bringing together academics, industry experts and engineers. A professorship of CCS will be based at Edinburgh University, but other academic institutions will also be involved including Imperial College, London. Iberdrola Chairman Ignacio Galan said: "We believe that the UK can lead the world with CCS technology, creating new skills, jobs and opportunities for growth. "There is the potential to create an industry on the same scale as North Sea Oil, and we will invest in Scotland and the UK to help to realise this potential." The Longannet power station opened in 1969 and is the second largest in the UK. The station chimney is 183m tall, the second highest free-standing structure in Scotland.